Larger tiger prawns are particularly sought after for Japanese cuisine. Grading Grading can vary by supplier and region. Data presented are for black tiger prawn. Tiger prawns are large and flavoursome. Their majestic red striping makes for impressive presentation and they are often the choice of top hotels and restaurants. Grilling, barbecuing or flambÈing tiger prawns in their shell are among the most popular cooking methods, as are pan- and deep frying. It is important to note that prawns cook quickly and that overcooking may cause the flesh to become tough. When cooking, add them to the heat as late as possible. Tiger prawns are popular as garlic prawns. Their flavour will be enhanced by marinating in olive oil, lemon juice and lashings of garlic for one hour to tenderise and par-cook the flesh. For a spectacular dish, flambÈ these prawns with Australian liqueur brandy and add the juice and zest of orange. Flesh Colour Translucent when raw and white to pink with pinkish bands when cooked. Farmed prawns are more distinctly marked than wild prawns and exhibit a bright red colouration when cooked. Price Tiger prawns are high-priced prawns. 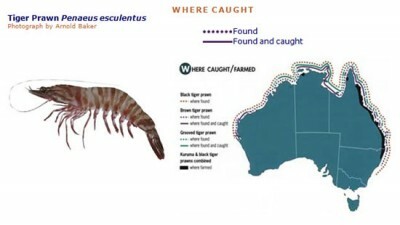 Price depends upon grade larger tiger prawns are higher priced than smaller tiger prawns. Head sections are eaten in Asian dishes but for the purposes of food safety are best avoided. A zesty and youthful sauvignon blanc is a perfect accompaniment for garlic prawns because it tames down the natural prawn oiliness and the contribution from butter or cooking oils. Try some of the racy and understated sauvignon blancs from Margaret River, or those ever-so-elegant sauvignon blancsemillon blends from the south-west of Western Australia.